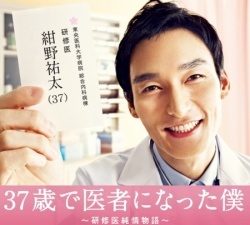 A former salary man, Konno Yuta one day decides to re-enter a medical university. He successfully becomes a practitioner at age 37, and begins to work at a university hospital as a medical intern. Yuta had hoped to become a full-fledged doctor as soon as he could, but the reality he faces at the hospital are appalling. It's as if Yuta had gone back in time tens of years ago when working conditions were incredibly harsh, doctors saw their patients only as sources for research, and rounds made by the professor only impose burden to both doctors and patients. At times being rejected by a younger superior, and at times confronting professors, Kenta comes to believe in one faith, and searches for the "medical treatment patients truly desire". Joy, conflict, distress… It's a human love story that will inspire you no matter how old you are.